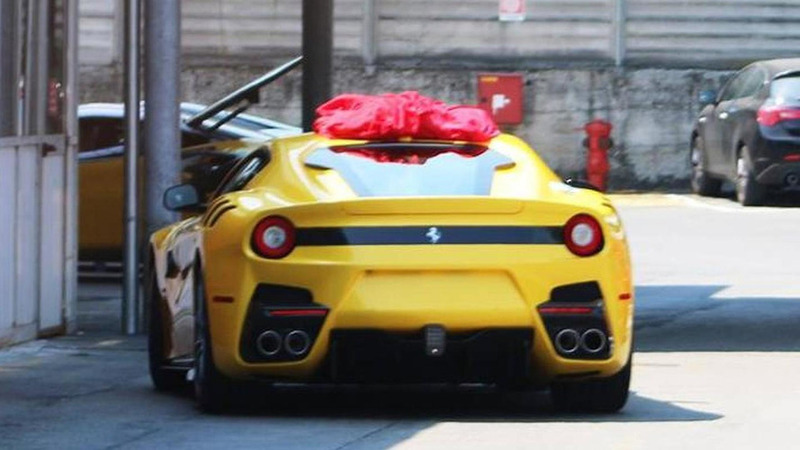 The Ferrari F12 Speciale has been spotted undisguised once again prior to an official debut during the Frankfurt Motor Show. It was earlier this week when we saw the model with completely no camouflage and now it’s back in yet another revealing photo. Judging by the surroundings and the cars nearby, the picture was probably taken at the same place as the previous time – most likely, the Ferrari factory in Maranello. Notable from this point of view are the quad exhaust system, the redesigned bumper, the small rear spoiler lip and what appears to be some kind of third brake light integrated into the lower part of the bumper. Previous photos revealed the supercar will also gain vented rear fenders. From what we know about the F12 Speciale (name not confirmed) so far, the car could be up to 200 kg (441 lbs) lighter than the F12 Berlinetta and will feature a retuned V12 engine with a total output of 760 bhp (567 kW). 0-100 km/h (0-62 mph) acceleration will likely take less than 3 seconds. A full reveal is expected during the 2015 IAA, while an online debut could occur even earlier.